Ugh…no longer do beastly men need sharp rocks to rid themselves of that Woolly Mammoth pelt that grows on their back. This is where Pleistocene and digital meet and where Mangroomer is the bridge between the two eras in human history. Mangroomer provides a device in which it essentially, clubs the back hair into submission, and thus improving in one’s chances of finding a suitable mate. Options and variety in life, some say, “is the spice of life”. I tend to agree. Up until now, I have only reviewed back shavers with actual razors attached to them, so this is my first review of this style of a shaver. I was skeptical and eager to try an electric shaver, as I really have never used one before, either face or back. Why not first try an electric shaver on my back first, and to gain some experience with this type of shaver. 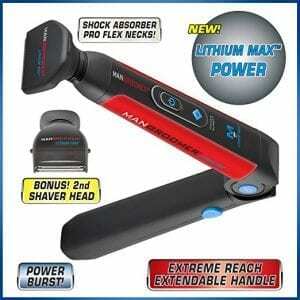 This leads me to my review of the Mangroomer Lithium Max Back Shaver Review. 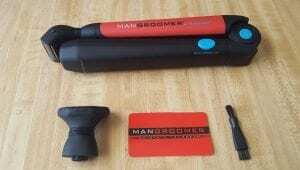 I was pretty skeptical at first before using the Mangroomer but also welcomed the chance to review it. I doubted the ability for it to reach my whole back and to provide a clean close shave by my preconceived negative notions of gadgets. You know what I am talking about, late night infomercials jump right to the forefront. That stuff never really works. But…how wrong I was. A good man admits when wrongdom takes place. So, I ADMIT…I admit. If you are looking for a back shaver that isn’t an electric shaver, I highly recommend the baKblade, you can read my full in-depth review here, What Is baKblade? Now, let us descend into this cave with our trusty buzzing Mangroomer lighting the way into self-knowledge towards our monolith. If you love gadgets and have a hairy back…Dude, you got to get this. Mangroomer has lots of moving parts and options on this beast. 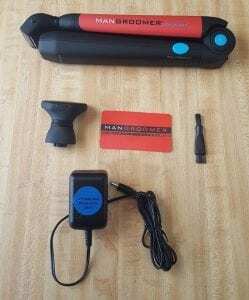 The Lithium Max Back Shaver is the top of the line shaver from Mangroomer, as they have four models in which to choose from. The Lithium Max is the most recent and advanced back shaver they have built, with over 11 years in R&D it’s pretty apparent when you use one. It is a cordless electric shaver with a lithium battery for a maximum number of shavings between chargings. Lithium batteries charge faster and hold a charge the best, great to see in this product and a real positive. The two shaving heads provide a real one, two punch for dealing with unsightly back hair. The back shaver head is slightly larger and this is for attacking a larger area and for cutting down the longer hair. While the foil type shaver (Body Groomer Head) is designed to attack and shave the shorter hairs and provide a smooth shave. Lithium Max battery – currently the only model to have a lithium battery. 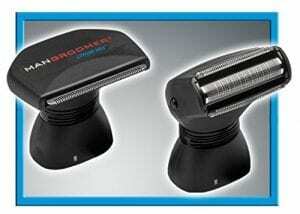 2 Attachable Shaving Heads. One for trimming hair and one for shaving hair. Shock absorbing heads. This allows the shaving heads to flex properly when shaving the contours of the back. Power Burst® Button – For a boost in shaving power. How Does ManGroomer Max Perform? Very pleasantly surprised! This is my first honest reaction to the question above, on how it works. It blew away my initial thoughts about it, by performing very well. The trimming head removes the bulk of the hair, then the Groomer Head comes in for relief and finishes off with a nice clean smooth shave. Not the closest of shaves, mind you, but a decent shave. Anybody knows that having used an electric facial shaver over a razor, that the razor gives the closest shave possible. No different here, but I would add it will leave your back baby skin smooth too. It needs to be mention, initial one would at least need to shave with both attachment heads, but if you regularly keep up shaving with the foil shaver head every so often, you need to use the Grooming Head attachment as general upkeep. If you let the hair go too long between shaves you’re going to have to use both attachment heads and thus increase your shaving time. The multiple settings for both angles of the attachment heads as well as the length of handle leave no room for missed hairs. You are able to hit the whole back comfortably. It feels well designed when extended and shaving your back and able to reach anywhere. The most adjustable and reachable handle I have reviewed to date. What Is Included When You Buy It? 1 – Power cord for charging. 1 – Set of detailed instructions. 1 – Red warranty card with contact information. Two separate attachment heads. 1 – Back Shaver Head, designed to shave the longer hairs. 1 – Body Groomer Head, designed to shave the skin smooth and used after the using the Back Shaver Head, especially if you have long back hair. Heads attachment is easy to change. Two-speed settings. Regular speed and Power Burst speed. Allow you to open and extend shaver from 0 degrees all the way to 135 degrees. Giving you a total of 9 separate positions in which to choose from. Each click is 15 degrees, starting at 0, 15, 30, 45, 60, 75, 90, 105, 120, 135 degrees. Each position (degree it is set at) securely locks and shouldn’t move once you’re using it. Solid clicks which means it is built well. A blue locking button to lock the position, this is in the middle of the unit. The option to extend your reach even more by pushing the blue button on the handle (Extension Lock). the handle starts out at 9 1/4 inches and when fully extended, the handle extends to a total of 14 1/2 inches. Lithium battery. Reportedly, last three times longer than NiHD/NiCad batteries and fast charging. A two-sided brush for cleaning up hair on the Mangroomer unit. Detailed instructions. In a couple of different languages too. Sorry, no Caveman language! Oog Grog Ugh. You me go cave. A cheaper option than waxing and laser treatment. Leaves no skin irritations at all! Allows a man to be a man and not asking for help shaving his back. Thank you, Mangroomer. Thank you. Can also be used for manscaping. Goldilocks weight, not too heavy, not too light, just right. Water and shaving cream not needed. Decent price for what is delivered. Slightly hard to open and close as well as loud pops with each degree extended. Not a big deal but worthy of note. When I use the Body Groomer Head head attachment it kind of pulls the longer hairs that I missed. My fault, I know, I should spend more time on doing a thorough job with the first head attachment. Need to use the two head attachments to get a close shave. Increased time in shaving as you must go over your back twice with the different attachment heads. But this system works! Shaver’s heads are not that wide the widest being at 1 3/4 inches. I am used to 4 inches of blade with the razor versions. The general consensus is they last for 2 years. Some people don’t like getting the hair down or below the skin surface level, due to the itchiness when the hair starts to grow back. That is where the Back Shaver attachment head comes into play, as this allows you the opportunity to just cut the hair down close to the skin but not enough to make the skin itchy when it starts growing back. Don’t be afraid to adjust the angle or length of the handle when shaving. This will guarantee to not miss a spot. So make frequent adjustments when needed. Use multiple passes, since no skin irritations will incur this isn’t really a problem. I found I get the best results with multiple passes with both shaving heads. Just expect a little more shaving time with the multiple passes. With virtually no competition in the way of an electric back shaver, you’d think that that the Mangroomer would be mediocre, but this is not the case. It provides an excellent shave with high refinement, from shave quality to handle design. I wouldn’t hesitate to recommend Mangroomer Lithium Max to anyone seeking for riddance of back foliage. Much designed and care went into this product, one can tell after just using this for a few minutes. It simply works. I think some people would prefer an electric back shaver over a razored back shaver for many reasons. After using it I can see why and I think you would see why too. 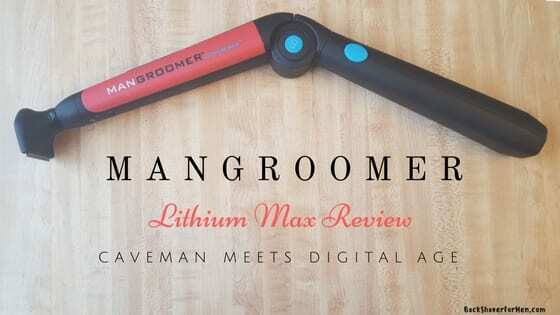 So if you are inclined to avoid nicks on your back or like the fully adjustable handle, give Mangroomer Lithium Max a try and see for yourself. A great electrical back shaver! High marks all around! Thought I Dislike It, But I Actually Love It! Due to the increase time to properly shave it receives a lower performance score. Awesome adjustability in shaving angle and length! Love to hear any comments or questions are always welcomed at BackShaverForMen. ← What Is The baKblade 2.0?